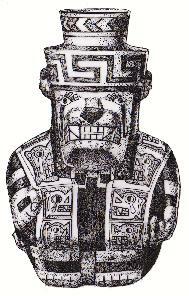 Description: face-neck jar, ID number missing, M.N.A.A.H.-Lima. 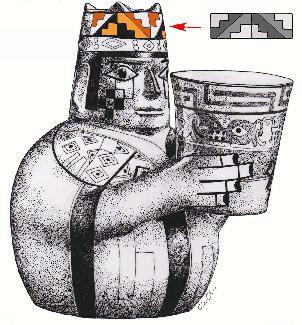 Iconographic Features: Wari Tocapus: nobleman wearing a hat and a tunic. 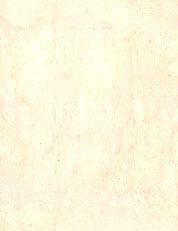 Tunic is decorated with tocapus (diagonal double circle and dot motif). Face is painted with Stepped-Triangle Tocapus, proofing that tocapu signs were also used for body painting. 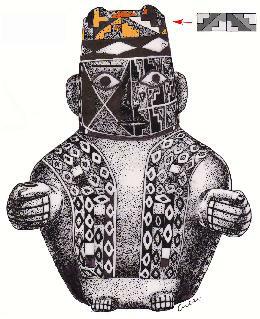 Description: effigy vessel, ID number missing, Amano Museum, Lima. 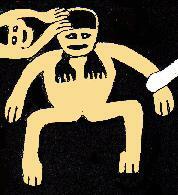 Iconographic Features: Wari Tocapus: nobleman holding a keru. He wears a four-cornered hat with Stepped-Triangle Tocapus. 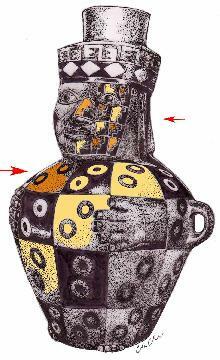 Iconographic Features: Wari Tocapus: nobleman (staff bearer) wearing a four-cornered hat with Stepped-Triangle Tocapus. Face painted with Stepped-Triangle Tocapus. 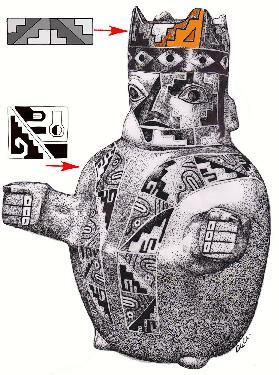 Iconographic Features: Wari Tocapus: nobleman (staff bearer) wearing a four-cornered hat with Stepped-Triangle Tocapus. Tunic decorated with diagonal double motif (Sawyer 1963) (tocapus?). Iconographic Features: Wari Tocapus: Feline Sacrificer wearing a tunic decorated with tocapu-ish motifs featuring the head of the Feline Sacrificer. 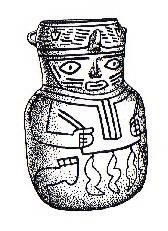 Description: effigy vessel, drawing after Guía de Arqueología 1975, lam. XIV. 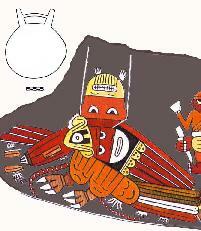 Iconographic Features: sitting human figure with fox skin headdress holding capsicum pepper (ají). 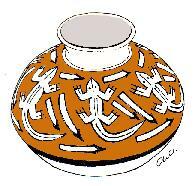 Description: jar, ID number missing, drawing after Reinhard/Townsend 1993. Iconographic Features: lizards/iguanas surrounded by spears (hunting scene?). Description: cup bowl (detail), C-32976, M.N.A.A.H.-Lima. Iconographic Features: Horrible Bird. Cup with two perforations. Description: double spout bottle, ID number missing, Linden-Museum, Stuttgart. 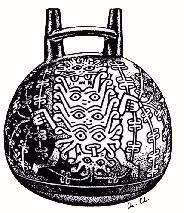 Iconographic Features: Rayed Faces forming a chain. One of them holds staffs. Description: bottle (detail), C-12075, M.N.A.A.H.-Lima. Iconographic Features: trophy (head) rack.